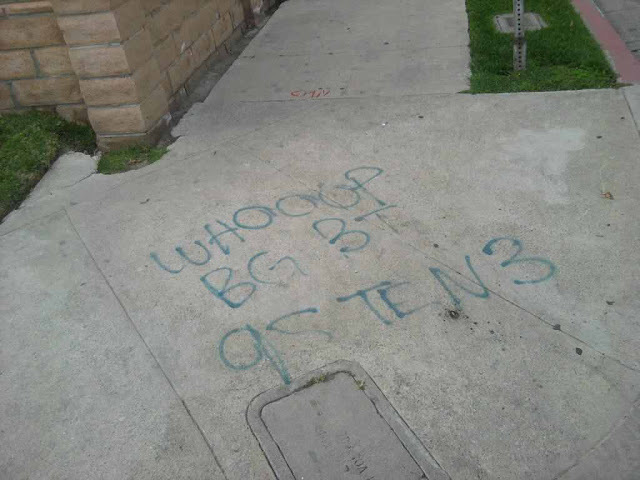 The Blue Gate Mafia Crips (BGMC) are predominantly an African-American street gang located on the East Side in the Watts district of South Los Angeles, California. The Blue Gate Mafia Crips originated around the Washington Courts (low-income apartments) in the 1980’s. The apartments spread from 103rd Street to Century Blvd, between Grandee Ave and Wilmington Ave.
Their name (Blue Gate) is the result of a blue security gate that surround the main entrance of the apartment complex. The Blue Gate Mafia Crips falls under the Mafia Crips umbrella. They have a tight family alliance with the Beach Town Mafia Crips and the Fudge Town Mafia Crips, as well as the 99 Watts Mafia Crips. Allies include: all Mafia Crips such as: Main Street Mafia Crips, Macc Mafia Crips, Blvd Mafia Crips, and the Angelo Mafia Crips. Rivals include: Bounty Hunter Bloods, Grape Street Crips, Hard Time Hustler Crips, Circle City Pirus, Hat Gang Watts, Be-Bop Bloods, and the Hacienda Village Bloods as well as the Eight Tray Gangster Crips.